Having the opportunity to review Drive Thru History Adventures was almost like a dream for my family. Dave Stotts and his amazing team have been a part of our homeschool for a few years now. So, we were familiar with their excellent work. Because we were already pretty familiar with the Drive Thru History homeschool videos, we approached this review in a different way. My concern was that we would view the content once and then not really utilize the membership again thinking it was something we have already seen. 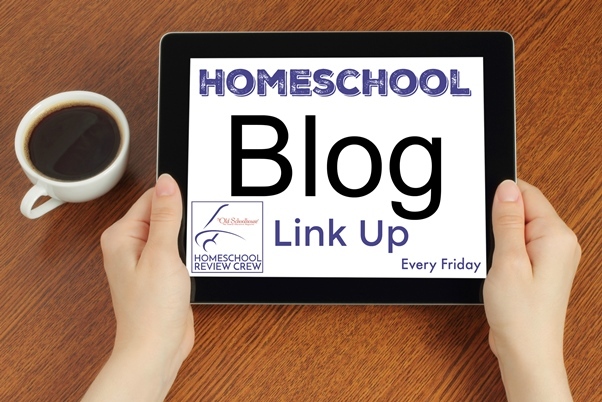 Determined to look at the site (and the content) with fresh eyes, we decided to go through the homeschool Bible History video curriculum together. We thought it would be great for my 9-year-old daughter as she completes her catechism course. Figuring it would reinforce the themes we were already discussing. So, we went in looking and listening for information that would relate to those themes. 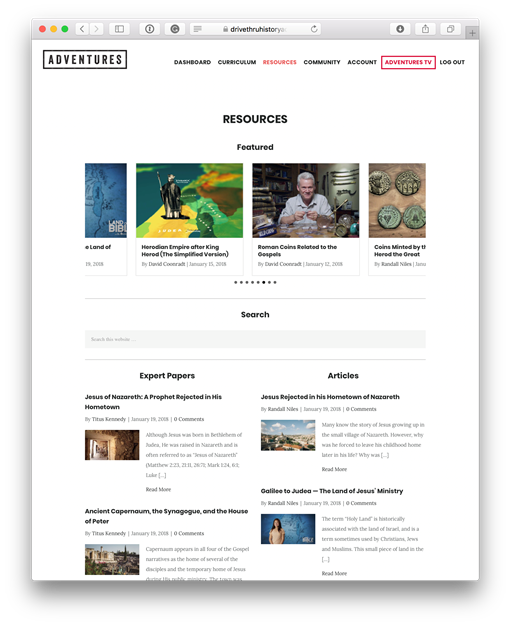 To become a part of history’s Adventures, you first must go to the site and decide on a subscription level. 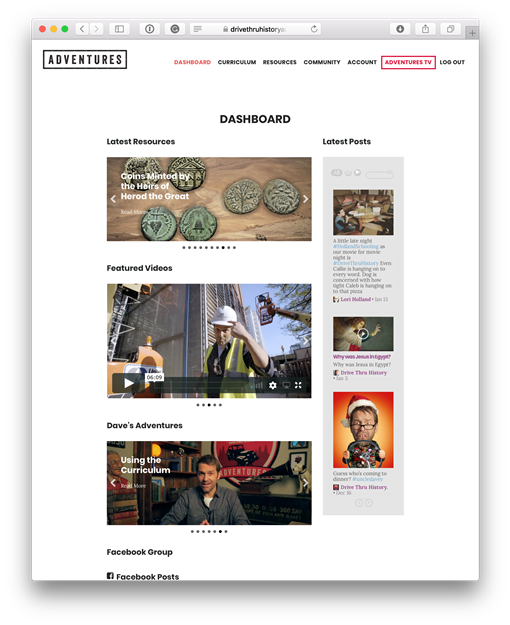 Drive Thru History Adventures gives flexible options for Yearly or Monthly subscriptions. 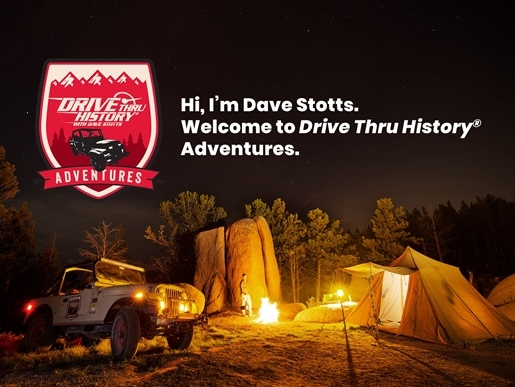 Once subscribed, I received a Welcome to Drive Thru History Adventures email from Dave Stotts. The email explained how our subscription worked and introduced us to Adventures. TV. Adventures.TV is a super convenient way to stream all the Drive Thru History Adventures shows, episodes and specials while we are traveling. Or, in our case, while my daughter spent time with Nana and Papa during their three-month stay. Anyone familiar with the Drive Thru History DVD series and carrying around the portable DVD players will appreciate this new format. Once I clicked on the link, I was taken to the site and a Welcome to Drive Thru History Adventures video. There, Dave explained in a bit more detail how to navigate through the site. As suggested by Dave, I went to the Dashboard to get the latest news and articles. So (also suggested by Dave), I clicked the link to join the Private – subscribers only – Facebook group. And trust me, they’re checking. I know this because they post a welcome message to the group greeting the new Adventurer by name. In the Facebook group, Drive Thru History Adventures is very active. If you leave a comment (because I’m sure you will join), don’t be surprised if you receive a response from DTHA or even Dave Stotts, himself. That is a personal touch that I, as a parent, appreciate. Next, I clicked on the Curriculum tab. I wanted to see how Drive Thru History Adventures set up the Bible History Curriculum. On the Curriculum page, you’ll find snippets of what to expect in each course. I look forward to the addition of new courses. Once I clicked on the Get Started button, I was sent to a listing of 18 episodes of The Gospels. At the bottom of the listing is a short video with Dave Stotts explaining how to use the Bible History curriculum. Each episode includes the video, Scripture Readings, and discussion questions. Something I thought was excellent to help my daughter get a better understanding. I did not print out the discussion questions, but I did use them with my daughter. And although I thoroughly enjoyed our discussions, there was one question I did not anticipate answering in the second week of the course. That question lets me know that she was paying attention and listening. And that she wanted clarity. Which was one of my goals for the outcome of this course. That while she went through her catechism course, she would get more clarity on the subject to of Jesus. My answer was a simple dictionary answer. That seemed to satisfy her. But, I do want to thank Dave and the team for bringing that up, because it wasn’t coming out of my mouth. There is also a section titled Digging Deeper. It gives even more content and information on topics that are mentioned during the episodes. I personally dug into that to learn more about the historical impact of Jesus. After all, it’s great to know our history. It’s better to understand how that history affects us. And Drive Thru History Adventures helps deliver that understanding in a convenient format. Dave continues to add resources to The Gospels program, which is great. The course is always evolving. Which squashed my concerns about the content possibly getting old to us. Dave even brings the community Behind the Scenes with him. With sneak peeks, previews and bloopers, he and the team really include you in the Adventure. It becomes so much more than a history lesson. It is Adventure Learning. With the behind the scenes stories and videos, I’m loving Dave’s weekly updates on Adventures.TV. He gives a quick update on what is happening with the team and what is going on in Drive Thru History Adventures. And, he sometimes answers questions from the Drive Thru History Adventures community. Continuing to be actively involved with the Drive Thru History “Adventurers”. Speaking of active involvement, look what we got in the post. Yeah, check the address label, Y’all. That’s active involvement. From a program and a community that is constantly growing. Note: I’m glad that I haven’t changed my local number since before my youngest was born. That’s how my post office contacted me. Phones have changed (a lot). The number hasn’t. While I would normally end my reviews with something I feel the product is lacking, with Drive Thru History Adventures, I have nothing. 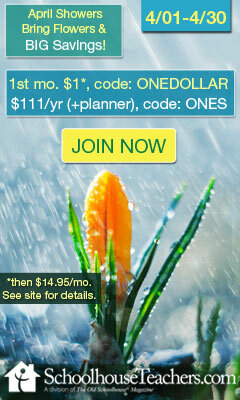 I highly recommend this membership. The monthly subscription is super affordable. And if you want to dive in and not have to think about it anymore, go Yearly. Adventures.TV is included with both. And because Dave Stotts and the Drive Thru History Adventures team continue to add new content and resources, I know I will be renewing our membership. I want to be a part of the Adventure. Want to read more reviews about this product? Click on the banner below.